PRATT – Have you ever considered paddlefish snagging? Whether you answered yes or no, consider this a “sign” that this is your year to try it. Hooking one of these pre-historic-looking giants on the end of your line is one of the most unique fishing opportunities Kansas has to offer, and if you’ve yet to give it a go, it’s time to change that. Here are some things you need to know to get started. The Kansas paddlefish season runs March 15–May 15 during the annual spring spawning run. Paddlefish permit-holders can snag up to two fish per day, and six for the season, from designated areas on the Neosho and Marais des Cygnes rivers. Paddlefish permits, which include six carcass tags, are $12.50 for anglers 16 and older, and $7.50 for youth 15 and younger. Unless exempt, paddlefish snaggers must also have a Kansas fishing license. Paddlefish may be taken inside Chetopa and Burlington city parks on the Neosho River; on the Neosho River at Iola, downstream from the dam to the city limits; on the Marais des Cygnes River below Osawatomie Dam, downstream to a posted boundary; on the Marais des Cygnes River on the upstream boundary of the Marais des Cygnes Wildlife Area, downstream to the Kansas-Missouri border; and the Browning Oxbow of the Missouri River (Doniphan County). While the snagging season will open at these locations, certain conditions are necessary for paddlefish to be present. Water temperatures of 50-55 degrees and an increase in river flow will start paddlefish moving upstream out of reservoirs. The Neosho River at Chetopa is the most popular snagging site in Kansas, but for paddlefish to be present there requires a significant increase in river flow. 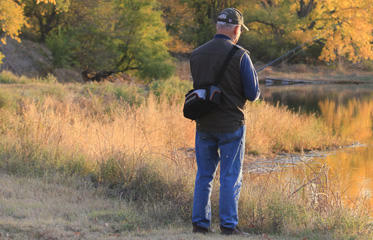 It’s a good idea to call local Kansas Department of Wildlife, Parks and Tourism offices or area bait shops for river and angler updates before traveling to a site. Paddlefish may be snagged using pole and line with not more than two single or treble hooks. Barbless hooks must be used in Chetopa City Park. Catch and release is allowed in Burlington, Chetopa, and Iola, except that once attached to a stringer, a fish becomes part of the daily creel limit. On the Missouri River boundary waters, there is a 24-inch minimum length limit. On the Marias des Cygnes River there is a 34-inch minimum length limit. Immediately upon harvest, anglers must sign a carcass tag, record the county, date and time of harvest, and attach the tag to the lower jaw of the paddlefish. Paddlefish caught out of season or in non-snagging areas may be kept only if they are hooked inside the mouth.